World’s largest two-wheeler manufacturer, Hero MotoCorp Ltd. (HMCL) has crossed a monthly sales of 6 lakh two-wheelers yet again. In a sales report published by Hero MotoCorp for the month of September, the company stated that it sold 606,744 2-wheeler and its range of products in a sluggish market. With records like this, Hero MotoCorp becomes the only Indian 2-wheeler manufacturer to have ever crossed the landmark of 6-lakh plus monthly sales. Even in the past, on three different occasions, the 2-wheeler giant had surpassed the 6 lakh monthly sales mark during September 2014 (604,052), May 2014 (602,481) and October 2013 (625,420). Hero MotoCorp has consolidated its share in the domestic motorcycle market to 52% and in the 125cc segment to close to 50%. It has been an action-packed month of September for Hero. The first global manufacturing facility of Hero MotoCorp, at Villa Rica in Colombia, went on stream in early September. 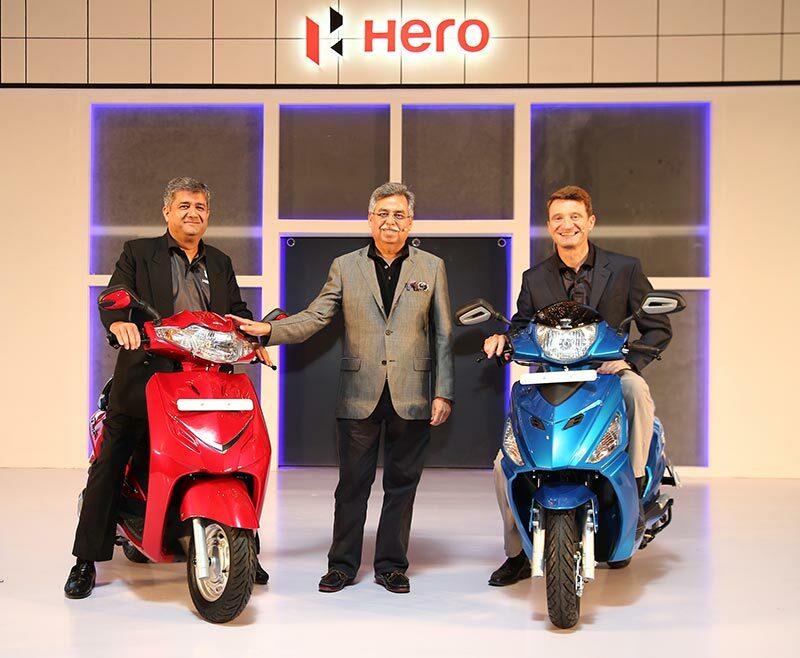 Last week, the Indian two-wheeler maker, Hero had introduced 2 new automatic scooters: Hero Duet and Hero Maestro Edge – the very first products to use the new platforms which are developed using the in-house technology. Talking about the newly introduced scooters from Hero, the 110cc Maestro Edge is a premium product that comes with dynamic design and features. Some of the unique features of Maestro Edge 110cc include Key with E-Code, Mobile Charging Port, Remote Seat Opening, Remote fuel-lid opening, Pass Switch and Twin Parking Lamps. Digital Analogue Meter Console, External Fuel Filling, European Switches, Titanium Muffler Cover & Protector further add to the style quotient. This scooter was first introduced in Colombia with the name Dash. Hero MotoCorp also inaugurated its first overseas manufacturing facility ever. The second scooter introduced by Hero is the attractive 110cc Duet that comes with metal body, making it sturdy as well as durable. Duet has been designed for wide spectrum of customers, its array of features, such as, Under-Seat Mobile Charging Port, Remote Seat Opening, Remote Fuel-lid Opening, Pass Switch etc, provides the rider with convenience like never before for a great riding experience. Both scooters feature multiple safety and convenience features including the side stand indicator, front luggage box, boot light and throttle position sensor (TPS). The Maestro Edge will be launched across markets by middle of October with a starting price of Rs. 49,500 (Ex-showroom Delhi) for the LX version and Rs. 50,700 (Ex-showroom Delhi) for the VX version. The market launch of the Duet will follow thereafter.